An announcement will be given via Twitter (@ascj20xx) when new information is available online. The program of the conference has been uploaded. Click here to download the program. Information on hotels near the conference venue and shuttle service between Fuchinobe Station on the JR Yokohama Line and the venue is available here! Registration will begin at 9:15 a.m. on Saturday, June 29. 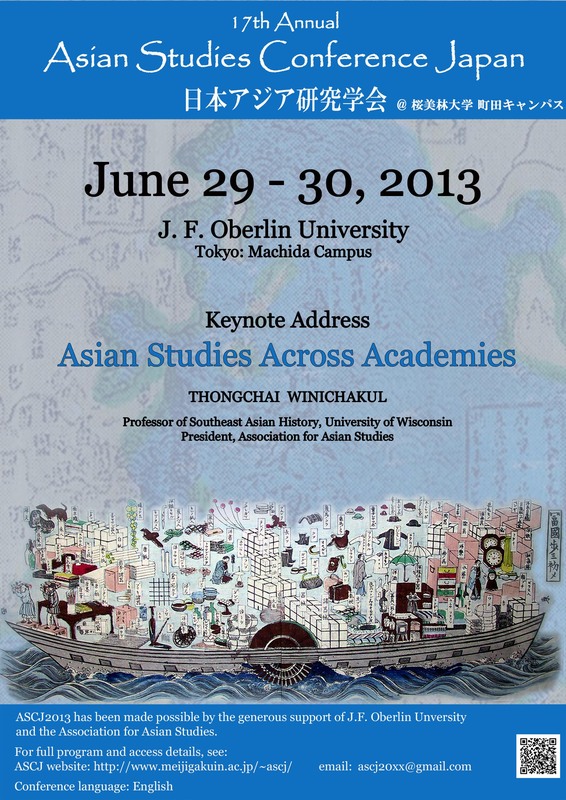 Sessions will be held in the building named Meimeikan of J. F. Oberlin University. All rooms are equipped with projector, video, DVD player, and overhead projector. The program of panels and sessions (including additional information on the conference venue) is now online. The PDF file of abstracts can be searched online or after downloading. For your convenience in browsing and printing, each session begins on a new page. The time, room number, and title of the session are indicated in a header. Abstracts will not be available at the conference. Check the online program to see when your panel or paper is scheduled, or for any changes not included in the full program, which has gone to the printer's. Email us if you find any errors in your listing. Organizers are asked to write to ascj20xx@gmail if there are any changes in their session. Individual paper presenters and members of panels/roundtables should do the same if there are any changes in name, affliliation, or paper title. The following 33 panels have been accepted for ASCJ 2013. They are listed in the order of the organizer's surname. Some titles have been abbreviated. For the complete list of organized panels with titles of papers and names of presenters click here. For the accepted individual papers, scroll down this page or click here. Chen, Yunyuan: Gender and Modernity under Japanese Ruling: Adoption or Adaption? The following 60 individual papers were accepted for ASCJ 2013. Your paper will be included in one of the thematically organized "Individual Paper Sessions"after you have registered for the conference. If you do not pre-register for the conference, your paper will not be included in the final program. Satoh, Keiichi and Reeya, Komoda: Organizational Background of the Explosion of the Social Movement after the Fukushima Accident: a New Phase of Japanese Civil Society?